Good morning! I have a pretty good Christmas card stash (much in part to Sparkle's weekly Christmas card challenges), but I didn't participate every week and still have a lot to make since we send out around 150 cards each year (yeah, I know... it's crazy!). I created this card for Taylored Expressions Sketch Challenge #90. I really liked this sketch and kept my card fairly simple, so I decided to mass produce it. I got together with my friend Gina yesterday to do some stamping and chatting, and I got off to a good start by stamping off a bunch of the sentiments and images, coloring the cupcakes and cutting out the circles and distressing them. My image is Lockhart's Holly Cupcake. I used the 2" JustRite circle stamper with the Times New Roman 15 pt alphabet to spell out my sentiment, "Merry Christmas From The Kraft Family". I also used some new goodies ~ some fun patterned paper recently released by Papertrey Ink and a holly border punch. I embossed the white strip with snowflakes. 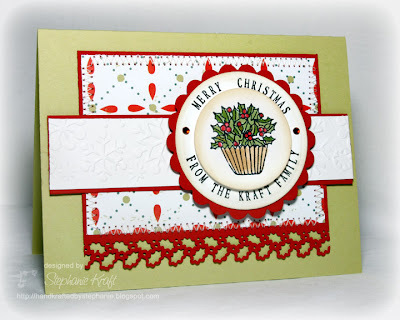 Accessories: Circle and Scalloped Circle Nestabilities (Spellbinders), Snowflake embossing folder (Provo Craft), Holly Edge stamp (Martha Stewart), Markers (Copic), Rhinestones (Kaisercraft), Foam tape, Thread, Sewing machine. So pretty! I always love all your border punches.